After buying a new smartphone, the first thing we begin to look for a working method of rooting it. In most cases, our developers are fast enough to come with a rooting exploit within hours of a device’s release, and when it is aSamsung Galaxy flagship, it is just obvious that we look to one man, Chainfire. CF-Auto-Root packages by Chainfire are the most known tools for rootingSamsung devices, and this time too the man is back in time with his weapon to gain root access on the Galaxy Note 3. With the release of his rooting package, it’s has now become very easy to root this new phablet device in just a few clicks. In the present guide, we would not only tell how how to root the Galaxy Note 3 SM-N900, but also describe the steps to install CWM Recovery on it. The procedure given below is considered risky and so it must not be taken for granted.Rooting voids the warranty of your device and the method might put your phone at risk. In case of any mishap, DroidViews or the developers will not be liable for the same. You are the master of your phone and decision both. Here are a few things to be taken care of before you move on to the real action. Please do not miss even a single item to avoid failure. Make sure you have install Samsung USB Drivers Or Kies on your computer. Turn on USB Debugging on your device by going to Settings> General> Developer options. 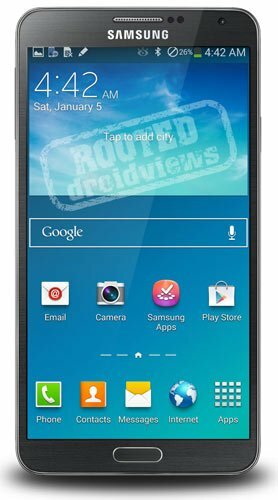 Boot your Note 3 into Download Mode. To do so, turn off your device and then press and hold the Volume Down + Home + Power buttons simultaneously for 2-3 seconds. When you see the warning screen, press Volume Up to continue to the Download Mode. Launch Odin and connect your phone to computer via USB cable. Wait till Odin detects your device. This is signaled by the ID:COM port turning to Blue and “Added! !” text at the message box on Odin. Make sure that only Auto Reboot and F. Reset Time option are checked on Odin. Click the PDA button and select the CF-Auto-Root file with .tar.md5 extension. Finally, click the Start button to initiate installation. CF-Root will be installed to your device in a matter of seconds and then you will see PASS!! message on Odin followed by automatic device reboot. Disconnect the USB cable and wait till the device reboots. Go to your phone’s app drawer. You should now see a new app called “SuperSU” there. This indicates that your device has root access now. To further verify it, install the Root Checker app from the Google Play Store and run it. Having rooted your Galaxy Note 3, you can also install ClockworkMod recovery on it. Please note that this step is mandatory. Install a custom recovery only if you wish to install a custom ROM or mod, or backup your ROM. as for the installation method for the CWM file, it is the same as the rooting part. Just repeat all the steps from above. The only thing to be be careful about this time is to select n900-cwm-recovery-6.0.3.8(0929).tar file at the 4th step when you click the PDA button.